I have always been fascinated by nuclear war. Mountain bunkers, missile gaps, MAD, – what is there not to like? So this post will be devoted to the doomsday weapons which continue tantalizing us with visions of post-nuclear nirvana. Because yes, despite the post-Cold War reduction in the Russian and US arsenals (consisting mostly of warheads being removed from missiles and stored in bunkers), the cessation of live testing, and overall better relations untinged by ideological confrontation, nuclear weapons and their associated delivery systems and C&C systems haven’t gone anywhere. That isn’t going to change any time soon. If anything, in an overpopulated world under increasing pressure from limits to growth, NBC weapons may re-assume their old primacy in strategic thinking. This post will be divided into the following sections: 1) a partial list of nuclear war scenarios, 2) a description of nuclear weapons basics and the current nuclear balance of power, and 3) myths about nuclear war – the most prominent being that a large-scale nuclear war is an extinction-level event, or even unwinnable (Herman Kahn and the other sons of Strangelove really do make valid points). First, here is a collection of nuclear war scenarios that are available online. I would also highly recommend watching the film Dr. Strangelove or: How I Learned to Stop Worrying and Love the Bomb – it is a true classic of American comedy / satire. The Effects of a Global Thermonuclear War – a reasonably realistic late-1980’s nuclear war scenario stemming from a NATO-Warsaw Pact conflict in central Europe, but consequences are probably too apocalyptic than would be the case in a real nuclear war. The Consequences of Nuclear Conflict between India and Pakistan – given their small arsenals, even a total nuclear war involving ground bursts over populated cities will leave 99% of Indians and 93% of Pakistanis alive. Their military forces remain intact and the demographic losses are made good in just a few years. Australia Nuclear War Scenario – rather unrealistic scenario involving Australia getting nuked in an unfolding world war between the US and China / Russia. What A Russian Nuclear Attack on the US Could Look Like (1999) – another rather unrealistic scenario in which Russia disrupts US communications networks by exploding EMP-emitting nuclear-armed satellites, decapitates the US leadership, and invades it. Threads – a good British movie from the late 1980’s about the aftermath of a nuclear war (see plot), of which it takes a bleak picture – though around 80% of the population survives the initial blasts, it is quickly whittled down to medieval levels (4-11mn) by the mid-1990’s due to the nuclear winter (famine), disease, and destruction of the ozone layer. Nuclear weapons revolutionized the theory of war. Before, states tended to fight (relatively) long wars and could only begin to exercise unrestrained coercion – or the credible threat of it – once they had destroyed the hostile armies and conquered the enemy territory. Now, the two superpowers, the US and the USSR, had the ability to unleash unprecedented violence against each other’s society within hours, well before their armies clashed on the battlefields of central Europe. The US was the first to test a nuclear bomb (and to use it), in 1945, though the USSR followed up in 1949, in large part thanks to its successful military-industrial espionage. Though the US enjoyed a brief period of nuclear primacy in the 1950’s thanks to its massive bomber forces, factors such as the development of the ICBM, the SLBM, and growing Soviet warhead numbers made a disarming US first strike increasingly unrealistic. Both powers having acquired survivable deterrents, a “balance of terror” set in (MAD). The introduction of MIRVed warheads in the 1970’s placed more incentives on making a first counterforce strike and tilted the cost-exchange ratio away from ABM, thus destabilizing the situation even as the two nuclear arsenals equalized in their overall destructive potential (the Soviets reached rough parity with the US during the 1970’s). Furthermore, apart from adding redundancy to the nuclear force, the SLBM was also destabilizing by increasing the chances of a decapitating strike against the leadership. As such, there were more efforts aimed at managing the nuclear standoff, such as the Moscow-Washington hotline, the construction of hardened complexes (Cheyenne, Yamantau), and a panoply of mobile C&C hubs to decrease nuclear commanders’ vulnerability. Despite the development of a substantial nuclear capability during the Cold War by the UK, France, and China – and their consequent proliferation to Israel, India, Pakistan, and North Korea – to this day the US and Russian arsenals remain the world’s largest by at least an order of magnitude. Russia is also believed to keep 16,000 tactical nukes in storage, which it plans to use as its conventional forces retreat before a NATO or Chinese ground invasion. (Here are some aggregates estimates of warhead numbers from the Guardian). Though there have been arguments by Lieber and Press that the 2000’s saw a return of US nuclear primacy, their conclusions have been hotly disputed. It is probably true that today the US has the ability to completely neutralize China’s means of nuclear retaliation in a first strike, because any surviving Chinese retaliation can be mopped up by sea-based Aegis/SM-3 assets in the Pacific and the Ground-based Midcourse Defense (GMD) installations at Vandenberg, California, and Fort Greely, Alaska. However, the same cannot be said of Russia, which has a much bigger and comprehensive nuclear arsenal and early warning system. Contrary to popular opinion, building a workable nuclear weapon mated to a robust delivery system is extremely hard. It is a highly complex synthesis of some of the most advanced technologies known to man, not a terrorist DIY job. A nuclear weapon… is a robust, reliable and miniaturized nuclear device (a warhead) that has been combined with a similarly robust and reliable delivery system. The importance of this synthesis should not be underestimated. Deliverability is a key feature of a nuclear weapon — and it must be a practical, militarily efficient means of delivery with a high probability of success. The challenges of achieving this synthesis are extensive. For a nuclear device to be deployed as a ballistic missile warhead, as a cruise missile warhead or as a gravity bomb, a series of very significant technical hurdles must be surmounted, including nuclear physics, materials science, rocketry, missile guidance and the like. The fabrication of fissile material alone — the one true limiting factor in the development of a nuclear device — presents significant challenges. The concept of separating a heavier isotope of uranium from a lighter isotope of uranium in order to enrich the stock to higher than 80 percent U235 — sufficient for use in weapons — is well understood. Separating something heavier from something lighter in a gaseous state is not all that hard. But doing it on a sufficiently refined level to separate two isotopes differentiated by only a few subatomic particles is extremely difficult. The alternative, reprocessing plutonium, is a chemical process not nearly as challenging as enrichment but it is extremely nasty, producing deadly levels of radioactivity, and it can only be done after plutonium has been created inside a nuclear reactor. … [see here for more on uranium enrichment]. Compared to the challenges of enrichment, the fabrication of a simple gun-type device like Little Boy is comparatively simple, though precise and extensive calculations are still required. But only uranium can be used in a gun-type device; plutonium requires the far more complex method of implosion, which presents numerous challenges, including the precise “lensing” of high-grade explosives. The purity of the lenses, their arrangement and the timing of the detonation must all be carefully crafted and coordinated to create a perfectly symmetrical explosion that compresses the plutonium core to a supercritical mass. Again, theoretically, it is a fairly understandable concept. In practice, however, it requires a great deal of knowledge and expertise. The creation of even the most primitive implosion device during the Manhattan Project challenged the best scientific minds and technology available at the time. First, delivery systems must be devised and both the bomb design and the payload capacity for the delivery system appropriately tailored. The delivery system itself — whether air-drop, cruise missile or ballistic missile — involves significant technological challenges, including aircraft design, subsystems integration and the development of complex guidance and propulsion systems. Indeed, these remain developmental challenges for many established nuclear powers. Ballistic missile design is an especially complex undertaking — to say nothing of mating such missiles with a submarine for undersea launch. In each case, the physics package (the components of the bomb that actually initiate a nuclear explosion) must be significantly miniaturized to one degree or another. A modern re-entry vehicle is a steep conical shape shorter than a human being that contains an even smaller physics package weighing only a few hundred pounds. Getting a warhead down to this size is no easy task. It requires, among other things, precision manufacturing, exceptional quality control and a keen understanding of nuclear physics. Then there are the decades of testing and practice necessary to ensure detonation upon delivery, national command authority controls and the like. Indeed, U.S. national laboratories still use some of the world’s most powerful supercomputers to model the effects of age on the current U.S. nuclear arsenal. Developing a nuclear weapon is not simply a matter of money, resources and brains. It also is the product of decades of testing (now frowned upon by the world community), design experience, numerous fielded weapons and a sustained annual investment of billions of dollars. Uranium nuclear fuel enrichment consists of four main steps. The first involves extracting uranium ore and processing (also known as milling) it into uranium oxide, commonly known as yellowcake. Second, most enrichment efforts — including Iran’s — then subject the yellowcake to a series of chemical reactions to create toxic uranium hexafluoride (UF6), which is useful for a variety of enrichment techniques. 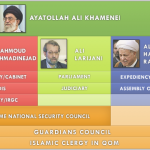 Third, in many cases — again including Iran’s — the UF6 then is run through “cascades” of centrifuges, or long chains of individual centrifuges connected together in a vacuum in gaseous form. Through this process, the percentage of the fissile isotope uranium 235 is increased to the point where the uranium can be used for power production. (Iran reportedly has aimed for an enrichment level of 3.5%, which is considered low-enriched uranium.) Fourth and last, once the uranium has been enriched to the desired level, it is then converted into fuel rods or pellets for use in a reactor. It is important to note that low-enriched uranium is not the same thing as highly enriched uranium (which is considered to be greater than 20%) — or uranium enriched to levels of 80-90% uranium 235 — which is considered sufficient for use in a crude nuclear device. Producing highly enriched uranium is not simply a matter of running the cascade cycle describe above over and over again. As the uranium becomes more enriched, the technology becomes increasingly delicate. Fine separation of the UF6 molecules and the minute calibration of the centrifuges necessary to carry this out, is required for this, and it is not clear that Iran’s centrifuges are of sufficient quality to attain these high levels of enrichment. See Nuclear Weapon Nations and Arsenals for a detailed discussion of national nuclear capabilities. Although building a few dozen simple nuclear weapons is relatively easy and has even been mastered by the likes of Pakistan, acquiring the panoply of hundreds or more thermonuclear devices mounted on a triad of delivery systems (bombers, ICBM’s, SLBM’s) is highly complex and open to a few states. However, doing so imparts near-strategic invulnerability. In a ever more unstable world of limits to growth, it is likely that nations like Germany and Japan will nuclearize, or at least intentionally build up the foundations for effecting a rapid, massive buildup of nuclear arms. There is one major development that is going to seriously undermine the effectiveness of nuclear weapons, necessitating the development of much more advanced and complex delivery systems. That is anti-ballistic missile defense (ABM). There are four mature BMD systems that are operational or in the process of being made operational: Aegis/Standard Missile-3 (SM-3), Terminal High Altitude Area Defense (THAAD), Patriot Advanced Capability-3 (PAC-3) and Ground-based Midcourse Defense (GMD). The Aegis/SM-3 system is capable of intercepting ballistic missiles during parts of the ascent and descent phases. This system has already been deployed on 18 American guided-missile cruisers and destroyers, and two Japanese Maritime Self-Defense Forces warships and is operationally proven (though as an anti-satellite weapon rather than a BMD interceptor). The Aegis/SM-3 has been one of the most successful BMD programs in the U.S. inventory, and Gates’ proposal would increase funding for the SM-3 program and upgrade an additional six warships with the system (double the three announced earlier this year for the Atlantic fleet). The THAAD system is mobile (designed to be deployed anywhere in the world) and is capable of intercepting a ballistic missile in its final midcourse descent and in its terminal phase, both inside and outside the atmosphere. The first THAAD battery — Alpha Battery of the 4th Air Defense Artillery Regiment at Fort Bliss in Texas — was activated last year and is in the process of being fully equipped. Meanwhile, testing continues at the Pacific Missile Range in Hawaii (a test there in March marked the system’s latest success). After poor test performance in the 1990s, the program restarted testing in 2005 and has shown marked improvement. It is now considered technologically mature. The Patriot Advanced Capability-3 (PAC-3) system is a terminal-phase intercept system that was operationally deployed and successfully used in Operation Iraqi Freedom. The Ground-based Midcourse Defense (GMD) system is also currently operational at Fort Greely in Alaska and Vandenberg Air Force Base in California, and is slated for deployment in Poland and the Czech Republic, although deployment of the system is encumbered by the requirement for fixed facilities, including concrete silos. Although as of today its scope is still limited to the rather modest task of defending against missile attacks from “rogue states” like Iran and North Korea, in the future it is not unfeasible to upgrade the American BMD to provide a substantial blanket even against Russia’s arsenal. 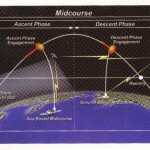 Furthermore, as these technologies mature the BMD system will move into space – rhetoric to the contrary, the presence of military surveillance satellites, anti-satellite weapons testing, and GPS (which the US uses for everything from squad level maneuvers to JDAM’s), means that space is already for all practical purposes weaponized except for the fact that the actual projectiles are not yet located there. … And for strategic, intercontinental BMD, space is inherently superior to terrestrial basing for interceptors in terms of coverage, flexibility and response time. Put another way, while near-term funding for such projects remains questionable, those projects are the logical ultimate trajectory of the deliberate pursuit of BMD now underway. But BMD aside, the Pentagon intends to dominate space the same way it dominates the world’s oceans: largely passively, allowing the free flow of international traffic, but with overwhelming and unchallenged military superiority. That will include not only defending assets in space, but holding those of a potential adversary at risk. Currently, Washington can do much of this from the ground; it is not only able to destroy a satellite with a BMD interceptor, it is also honing the technology to deny and disrupt access to space systems. Thus, as long as the American military-industrial complex remains lavishly funded – which is open to question – it will continue to develop a multi-tiered ABM shield, introduce new technologies like the Airborne Laser (ABL), Kinetic Energy Interceptor (KEI), and Network Centric Airborne Defense Element (NCADE), and reinforce its MASINT dominance. cloud of highly ionized air arises at the focus of the laser or microwave rays, at an altitude of up to 50 kilometers. Upon entering it, any object–a missile, an airplane, is deflected from its trajectory and disintegrates in response to the fantastic overloads arising due to the abrupt pressure difference …What is fundamental in this case is that the energy aimed by the terrestrial components of the plasma weapon–lasers and antennas–is concentrated not at the target itself but a little ahead of it. 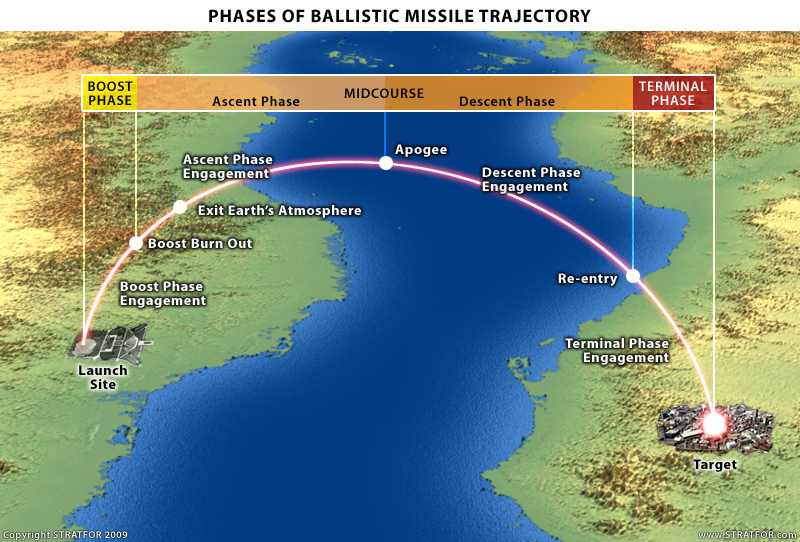 Rather than “incinerating” the missile or airplane, it “bumps” it out of trajectory. The Russians refer to such balls of plasma as plasmoids. Although there is some speculation that their high-power radar could produce plasmoids in the upper atmosphere for defensive use, this has not been proven. (Just, please, don’t mention HAARP.) 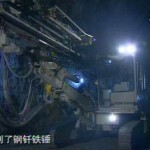 But the laser system used in PASS has been proven. Alex Long, CEO of Stellar Photonics, which makes the PASS laser, tells me that future systems will have much greater range than the current laser. The focusing requirements are much simpler than for high-power energy weapons like the Airborne Laser (or ABL, a ray gun-equipped 747 jet), making longer ranges more feasible. The technology which produces small plasma detonations in PASS could put larger plasmoids in the path of missiles and aircraft high in the atmosphere. Rather than using massive amounts of energy to burn through the missile’s casing, just a small amount of laser-created plasma could turn the missile’s own speed against it, tripping it up in a piece of cosmic judo. A small, low-energy pulse laser may turn out to be more effective for missile defense than the giant chemical laser in the $7.3 billion ABL. Other nations will counter by developing their own ABM systems, on current trends lagging the US by a decade or two, while acquiring new capabilities like ICBM‘s and SLBM‘s with advanced evasive measures and decoys, as well as next-generation strategic bombers and eventually, scramjet-based hypersonic weapons. If the latter are actualized and retain a high degree of survivability in an era of improving SAM technology, bombers may yet again come to dominate nuclear delivery systems, as they first did in the 1950’s. The basics of nuclear strategy (wiki). Nuclear War Survival Skills (free online book); especially see Chapter 1: The Dangers from Nuclear Weapons: Myths and Facts. One of the basic popular misconceptions of nuclear warfare is that it is a true Doomsday event leading to human extinction, or at the very least the collapse of global civilization. However, this is not backed even by primitive calculations that assume all the world’s urban areas (home to 50% of the world population) get blanket bombed, neglecting that a sizable portion of nuclear weapons will get eaten up by counter-force strikes (e.g. the missile silos of North Dakota), or will fail to launch / get taken out by enemy ABM / etc. ° Myth: Because some modern H-bombs are over 1000 times as powerful as the A-bomb that destroyed most of Hiroshima, these H-bombs are 1000 times as deadly and destructive. ° Facts: A nuclear weapon 1000 times as powerful as the one that blasted Hiroshima, if exploded under comparable conditions, produces equally serious blast damage to wood-frame houses over an area up to about 130 times as large, not 1000 times as large. For example, air bursting a 20-kiloton weapon at the optimum height to destroy most buildings will destroy or severely damage houses out to about 1.42 miles from ground zero.6 The circular area of at least severe blast damage will be about 6.33 square miles. (The explosion of a 20 kiloton weapon releases the same amount of energy as 20 thousand tons of TNT.) One thousand 20-kiloton weapons thus air burst, well separated to avoid overlap of their blast areas, would destroy or severely damage houses over areas totalling approximately 6,330 square miles. In contrast, similar air bursting of one 20- megaton weapon (equivalent in explosive power to 20 million tons of TNT) would destroy or severely damage the great majority of houses out to a distance of 16 miles from ground zero.6 The area of destruction would be about 800 square miles – not 6,330 square miles. ° Myth: Overkill would result if all the U.S. and U.S.S.R, nuclear weapons were used meaning not only that the two superpowers have more than enough weapons to kill all of each other’s people, but also that they have enough weapons to exterminate the human race. ° Facts: Statements that the U.S. and the Soviet Union have the power to kill the world’s population several times over are based on misleading calculations. One such calculation is to multiply the deaths produced per kiloton exploded over Hiroshima or Nagasaki by an estimate of the number of kilotons in either side’s arsenal. (A kiloton explosion is one that produces the same amount of energy as does 1000 tons of TNT.) The unstated assumption is that somehow the world’s population could be gathered into circular crowds, each a few miles in diameter with a population density equal to downtown Hiroshima or Nagasaki, and then a small (Hiroshima-sized) weapon would be exploded over the center of each crowd. Other misleading calculations are based on exaggerations of the dangers from long-lasting radiation and other harmful effects of a nuclear war. Nor will everyone die by lingering radiation – the critically-affected areas will be limited to areas downwind of ground bursts. Many thousands of tons of earth from the crater of a large explosion are pulverized into trillions of particles. These particles are contaminated by radioactive atoms produced by the nuclear explosion. Thousands of tons of the particles are carried up into a mushroom-shaped cloud, miles above the earth. 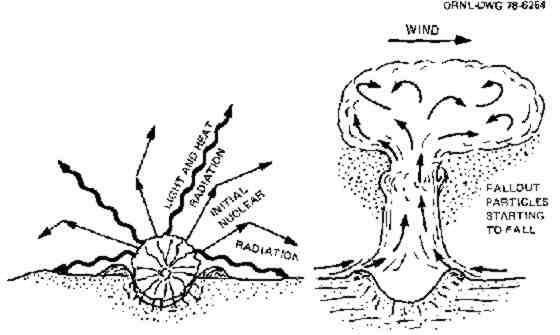 These radioactive particles then fall out of the mushroom cloud, or out of the dispersing cloud of particles blown by the winds thus becoming fallout. Each contaminated particle continuously gives off invisible radiation, much like a tiny X-ray machine while in the mushroom cloud, while descending, and after having fallen to earth. The descending radioactive particles are carried by the winds like the sand and dust particles of a miles-thick sandstorm cloud except that they usually are blown at lower speeds and in many areas the particles are so far apart that no cloud is seen. The largest, heaviest fallout particles reach the ground first, in locations close to the explosion. Many smaller particles are carried by the winds for tens to thousands of miles before falling to earth. At any one place where fallout from a single explosion is being deposited on the ground in concentrations high enough to require the use of shelters, deposition will be completed within a few hours. The smallest fallout particles those tiny enough to be inhaled into a person’s lungs are invisible to the naked eye. 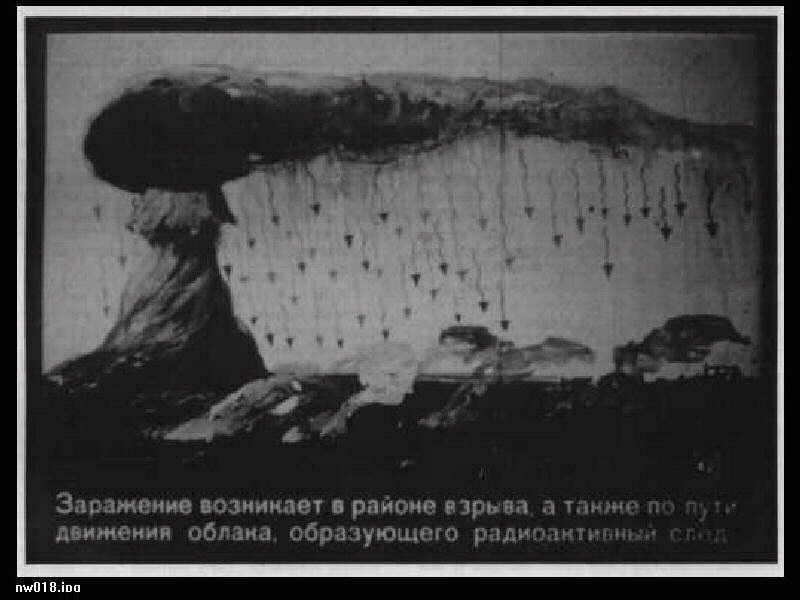 These tiny particles would fall so slowly from the four-mile or greater heights to which they would be injected by currently deployed Soviet warheads that most would remain airborne for weeks to years before reaching the ground. By that time their extremely wide dispersal and radioactive decay would make them much less dangerous. Only where such tiny particles are promptly brought to earth by rain- outs or snow-outs in scattered “hot spots,” and later dried and blown about by the winds, would these invisible particles constitute a long-term and relatively minor post-attack danger. The air in properly designed fallout shelters, even those without air filters, is free of radioactive particles and safe to breathe except in a few’ rare environments as will be explained later. If the dose rate 1 hour after an explosion is 1000 R/hr, it would take about 2 weeks for the dose rate to be reduced to 1 R/hr solely as a result of radioactive decay. Weathering effects will reduce the dose rate further,’ for example, rain can wash fallout particles from plants and houses to lower positions on or closer to the ground. Surrounding objects would reduce the radiation dose from these low-lying particles. 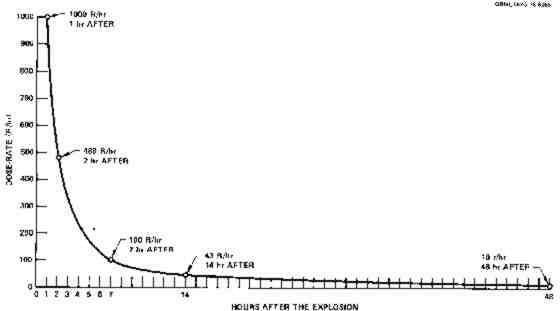 Figure 1.2 also illustrates the fact that at a typical location where a given amount of fallout from an explosion is deposited later than 1 hour after the explosion, the highest dose rate and the total dose received at that location are less than at a location where the same amount of fallout is deposited 1 hour after the explosion. The longer fallout particles have been airborne before reaching the ground, the less dangerous is their radiation. Within two weeks after an attack the occupants of most shelters could safely stop using them, or could work outside the shelters for an increasing number of hours each day. Exceptions would be in areas of extremely heavy fallout such as might occur downwind from important targets attacked with many weapons, especially missile sites and very large cities. To know when to come out safely, occupants either would need a reliable fallout meter to measure the changing radiation dangers, or must receive information based on measurements made nearby with a reliable instrument. Fortunately, the human body can repair most radiation damage if the daily radiation doses are not too large. As will be explained in Appendix B, a person who is healthy and has not been exposed in the past two weeks to a total radiation dose of more than 100 R can receive a dose of 6 R each day for at least two months without being incapacitated. Only a very small fraction of Hiroshima and Nagasaki citizens who survived radiation doses some of which were nearly fatal have suffered serious delayed effects. The reader should realize that to do essential work after a massive nuclear attack, many survivors must be willing to receive much larger radiation doses than are normally permissible. Otherwise, too many workers would stay inside shelter too much of the time, and work that would be vital to national recovery could not be done. For example, if the great majority of truckers were so fearful of receiving even non-incapacitating radiation doses that they would refuse to transport food, additional millions would die from starvation alone. ° Myth: Fallout radiation penetrates everything; there is no escaping its deadly effects. ° Facts: Some gamma radiation from fallout will penetrate the shielding materials of even an excellent shelter and reach its occupants. However, the radiation dose that the occupants of an excellent shelter would receive while inside this shelter can be reduced to a dose smaller than the average American receives during his lifetime from X rays and other radiation exposures normal in America today. The design features of such a shelter include the use of a sufficient thickness of earth or other heavy shielding material. Gamma rays are like X rays, but more penetrating. 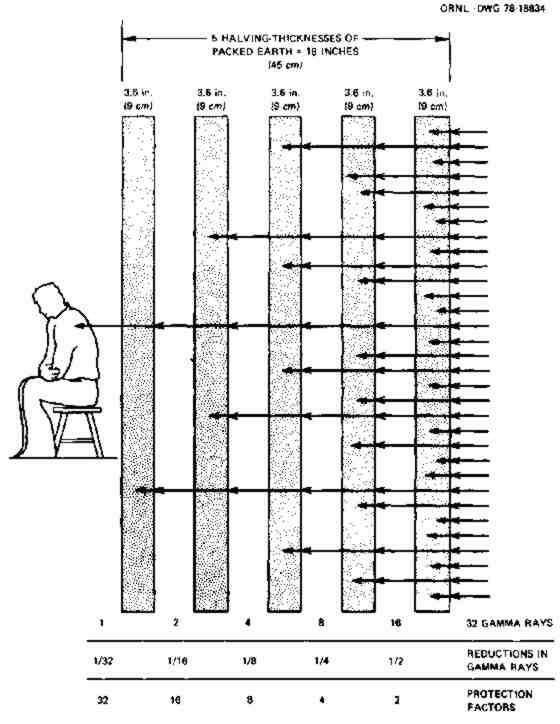 Figure 1.3 shows how rapidly gamma rays are reduced in number (but not in their ability to penetrate) by layers of packed earth. Each of the layers shown is one halving-thickness of packed earth- about 3.6 inches (9 centimeters).3 A halving- thickness is the thickness of a material which reduces by half the dose of radiation that passes through it. The actual paths of gamma rays passing through shielding materials are much more complicated, due to scattering, etc., than are the straight-line paths shown in Fig. 1.3. But when averaged out, the effectiveness of a halving-thickness of any material is approximately as shown. The denser a substance, the better it serves for shielding material. Thus, a halving-thickness of concrete is only about 2.4 inches (6.1 cm). If additional halving-thicknesses of packed earth shielding are successively added to the five thicknesses shown in Fig. 1.3, the protection factor (PF) is successively increased from 32 to 64, to 128, to 256, to 512, to 1024, and so on. Finally, sorry to disappoint our armchair nihilists, but “nuclear winter” or the destruction of the ozone layer certainly won’t do in civilization, let alone the human species. ° Myth: Blindness and a disastrous increase of cancers would be the fate of survivors of a nuclear war, because the nuclear explosions would destroy so much of the protective ozone in the stratosphere that far too much ultraviolet light would reach the earth’s surface. Even birds and insects would be blinded. People could not work outdoors in daytime for years without dark glasses, and would have to wear protective clothing to prevent incapacitating sunburn. Plants would be badly injured and food production greatly reduced. ° Facts: Large nuclear explosions do inject huge amounts of nitrogen oxides (gasses that destroy ozone) into the stratosphere. However, the percent of the stratospheric ozone destroyed by a given amount of nitrogen oxides has been greatly overestimated in almost all theoretical calculations and models. For example, the Soviet and U.S. atmospheric nuclear test explosions of large weapons in 1952-1962 were calculated by Foley and Ruderman to result in a reduction of more than 10 percent in total ozone. (See M. H. Foley and M. A. Ruderman, ‘Stratospheric NO from Past Nuclear Explosions”, Journal of Geophysics, Res. 78, 4441-4450.) Yet observations that they cited showed no reductions in ozone. Nor did ultraviolet increase. Other theoreticians calculated sizeable reductions in total ozone, but interpreted the observational data to indicate either no reduction, or much smaller reductions than their calculated ones. A realistic simplified estimate of the increased ultraviolet light dangers to American survivors of a large nuclear war equates these hazards to moving from San Francisco to sea level at the equator, where the sea level incidence of skin cancers (seldom fatal) is highest- about 10 times higher than the incidence at San Francisco. Many additional thousands of American survivors might get skin cancer, but little or no increase in skin cancers might result if in the post-attack world deliberate sun tanning and going around hatless went out of fashion. Furthermore, almost all of today’s warheads are smaller than those exploded in the large- weapons tests mentioned above; most would inject much smaller amounts of ozone-destroying gasses, or no gasses, into the stratosphere, where ozone deficiencies may persist for years. And nuclear weapons smaller than 500 kilotons result in increases (due to smog reactions) in upper tropospheric ozone. In a nuclear war, these increases would partially compensate for the upper-level tropospheric decreases-as explained by Julius S. Chang and Donald J. Wuebbles of Lawrence Livermore National Laboratory. ° Myth: Unsurvivable “nuclear winter” surely will follow a nuclear war. The world will be frozen if only 100 megatons (less than one percent of all nuclear weapons) are used to ignite cities. World-enveloping smoke from fires and the dust from surface bursts will prevent almost all sunlight and solar heat from reaching the earth’s surface. Universal darkness for weeks! Sub-zero temperatures, even in summertime! Frozen crops, even in the jungles of South America! Worldwide famine! Whole species of animals and plants exterminated! The survival of mankind in doubt! ° Facts: Unsurvivable “nuclear winter” is a discredited theory that, since its conception in 1982, has been used to frighten additional millions into believing that trying to survive a nuclear war is a waste of effort and resources, and that only by ridding the world of almost all nuclear weapons do we have a chance of surviving. Persons who want to learn more about possible post-attack climatic effects also should read the Fall 1986 issue of Foreign Affairs. This issue contains a long letter from Thompson and Schneider which further demolishes the theory of catastrophic “nuclear winter.” Continuing studies indicate there will be even smaller reductions in temperature than those calculated by Thompson and Schneider. Soviet propagandists promptly exploited belief in unsurvivable “nuclear winter” to increase fear of nuclear weapons and war, and to demoralize their enemies. Because raging city firestorms are needed to inject huge amounts of smoke into the stratosphere and thus, according to one discredited theory, prevent almost all solar heat from reaching the ground, the Soviets changed their descriptions of how a modern city will burn if blasted by a nuclear explosion. Translation: [Radioactive] contamination occurs in the area of the explosion and also along the trajectory of the cloud which forms a radioactive track. Firestorms destroyed the centers of Hamburg, Dresden, and Tokyo. The old-fashioned buildings of those cities contained large amounts of flammable materials, were ignited by many thousands of small incendiaries, and burned quickly as standing structures well supplied with air. No firestorm has ever injected smoke into the stratosphere, or caused appreciable cooling below its smoke cloud. The theory that smoke from burning cities and forests and dust from nuclear explosions would cause worldwide freezing temperatures was conceived in 1982 by the German atmospheric chemist and environmentalist Paul Crutzen, and continues to be promoted by a worldwide propaganda campaign. This well funded campaign began in 1983 with televised scientific-political meetings in Cambridge and Washington featuring American and Russian scientists. A barrage of newspaper and magazine articles followed, including a scaremongering article by Carl Sagan in the October 30, 1983 issue of Parade, the Sunday tabloid read by millions. The most influential article was featured in the December 23,1983 issue of Science (the weekly magazine of the American Association for the Advancement of Science): “Nuclear winter, global consequences of multiple nuclear explosions,” by five scientists, R. P. Turco, O. B. Toon, T. P. Ackerman, J. B. Pollack, and C. Sagan. Significantly, these activists listed their names to spell TTAPS, pronounced “taps,” the bugle call proclaiming “lights out” or the end of a military funeral. Until 1985, non-propagandizing scientists did not begin to effectively refute the numerous errors, unrealistic assumptions, and computer modelling weakness’ of the TTAPS and related “nuclear winter” hypotheses. A principal reason is that government organizations, private corporations, and most scientists generally avoid getting involved in political controversies, or making statements likely to enable antinuclear activists to accuse them of minimizing nuclear war dangers, thus undermining hopes for peace. Stephen Schneider has been called a fascist by some disarmament supporters for having written “Nuclear Winter Reappraised,” according to the Rocky Mountain News of July 6, 1986. Three days later, this paper, that until recently featured accounts of unsurvivable “nuclear winter,” criticized Carl Sagan and defended Thompson and Schneider in its lead editorial, “In Study of Nuclear Winter, Let Scientists Be Scientists.” In a free country, truth will out – although sometimes too late to effectively counter fast-hitting propaganda. Effective refutation of “nuclear winter” also was delayed by the prestige of politicians and of politically motivated scientists and scientific organizations endorsing the TTAPS forecast of worldwide doom. Furthermore, the weakness’ in the TTAPS hypothesis could not be effectively explored until adequate Government funding was made available to cover costs of lengthy, expensive studies, including improved computer modelling of interrelated, poorly understood meteorological phenomena. Serious climatic effects from a Soviet-U.S. nuclear war cannot be completely ruled out. However, possible deaths from uncertain climatic effects are a small danger compared to the incalculable millions in many countries likely to die from starvation caused by disastrous shortages of essentials of modern agriculture sure to result from a Soviet-American nuclear war, and by the cessation of most international food shipments. Finally, two more things of importance in nuclear warfare. In his (in)famous book On Thermonuclear War, Herman Kahn calculated that the complete destruction of the US top 53 metropolitan areas would result in serious economic damage, but would not terminate its industrial base. Substantial capacities would survive and will be able to be rebuilt quickly, especially if there are prewar preparations and the postwar government enforces savings on the population. Below is an edited table I’m reproducing from the book, which shows the 1954 output capacity of different sectors of the US economy, and the percentage of that capacity and the existing capital stock located outside the top 53 metropolitan areas and (kind of) expected to survive a large-scale nuclear war. Today, the spread of suburbia means that more of the strategic industries will have migrated outside the inner-city cores. This is bad for the US environment and the current account, but an advantage in surviving and rebuilding after a nuclear war. There is also a huge and strategically significant IT industry, soon to be supplemented by biotech and nanomanufacturing – however, most of the key facilities would again be located on the peripheries of the big cities. Exploding a nuclear weapon high over an adversary’s territory can produce an EMP effect disabling most of the non-hardened electronics over vast continental swathes, crippling the economy at a single stroke. In the US, almost all civilian and even some tactical-military systems are unhardened. The threat has grown since the early days of the Cold War, when electronics used vacuum tubes that were far more resistant to EMP effects than today’s integrated circuits. A good civil defense system (blast shelters underneath municipal buildings, grain stockpiles, urban metro systems, widespread EMP hardening, widespread distribution of Geiger counters & potassium iodide pills, prewar planning, dispersed machine tool stockpiles, air raid / missile strike warning sirens, etc) will vastly improve the survivability of a population and enhance the speed and scope of its postwar recovery. A good example of a prepared society is modern Switzerland, which has a nuclear shelter in almost every building, and to a lesser extent the late Soviet Union. In conjunction with an advanced ABM and SAM system, a society with a good civil defense system is probably capable of surviving, and fighting, a prolonged nuclear total war. What will a big nuclear war in the future look like? Since a (non-accidental) nuclear warfare is very unlikely today, fast forward to 2030-50, a time of incessant resource wars, climatic chaos, and new totalitarian ideologies – a world in which the weak states fail and wither away, while the strong erect barriers round their new empires (the US, China, Russia, France, etc). In this case, it might be instructive to look at what people though would happen if the Cold War had turned hot, especially if the superpowers introduced the nuclear element. Had everything managed to remain conventional to this point, it is here we see the point at which the survival of civilization as we know it hangs in the balance. The temptation on the American president would be enormous to start wiping out these gargantuan Soviet armies with the equally vast American nuclear arsenal. Equally, the temptation on the Soviet leadership would be substantial to trade queens with her great adversary, through counterforce first strike on American nuclear forces. 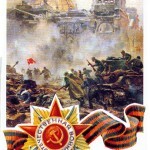 Were the US to strike tactically against the Soviet invasion force, escalation to countervalue strikes (against economic and population centers), was Soviet retaliatory doctrine itself, and the entire war would enter a new phase of global mass murder, as the Americans inevitably retaliate when their cities are vaporized by Russian rocketry. In the post-nuclear novel and movie, this is the point at which World War III ends and we are all reduced to wearing bearskins and roaming around stateless post-technological deserts. But the reality was probably a substantially worse world. If anything, disaster and mass murder tends to increase the authority of the state over populations, not collapse it. Was the power of the Nazi state more or less complete when her cities were smoldering ruins? In such situations people are rendered completely dependent on even a damaged state, when all other sources of power have been disrupted or destroyed…and in our scenario here, these are states which would not be inclined to give up the war having already lost so much. As the pre-war nuclear stockpiles are expended (mostly canceling each other out, rather than falling on cities), much of the population of both the United States and the Soviet Union would survive. Particularly if the build-up was a conventional escalation, allowing for the inevitable panic evacuation of dense urban areas. Therefore if you want a true retrofuturist nightmare-scape, imagine a nuclear World War III, but one in which after the horrendous nuclear exchange is largely over, you haven’t the saving grace of a desolate but free world and the end of the war. Imagine suffering a nuclear attack and yet the war going on…in a newly mass mobilized and utterly militarized and depopulating society….potentially for years, even decades. That was probably the real nightmare we escaped, now that these maps have thankfully become lost visions in a vanished dream of global war. In particular, the Soviet Union planned to fight a WMD war, especially using tactical nukes and chemical weapons to achieve a breakout in West Germany – while also developing an extensive biological weapons capability, presumably for strategic use against the farther-off US population. With its collapse, the specter of Armageddon has receded, but not completely; and as pointed out, it may yet return.